Like Airbnb, Uber has spawned a subset of startups that are looking to capitalize on the success of its premium, mobile, on-demand model and bring a little innovation to their chosen offline industries. Exec, Cherry, YourMechanic and Postmates are a few examples of the growing “Uber for X” category. Naturally, it was only a matter of time before the formula was applied to maids. That’s right. Get Maid, a New York-based startup, is launching today to take the hassle out of finding and scheduling a professional to clean your apartment. 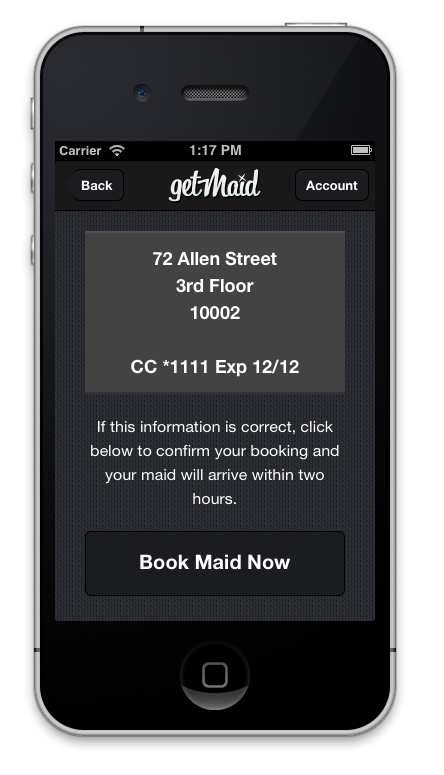 A la Uber and Exec, Get Maid is an on-demand, mobile-first premium service that makes it easy to quickly book a maid via its Android and iPhone apps or its website, GetMaid.com. The service charges a flat $45 hourly rate, which includes tip and eco-friendly cleaning supplies and is billed directly to the credit card on file after cleanings are finished. The hourly fees are also prorated, so, if the job is done in an hour and a half, you don’t end up paying for the whole second hour. Users can book anytime between 9:30am and 6:00pm, seven days a week. Prior to Get Maid, co-founder Steve Gutentag started the Entrepreneur Roundtable-incubated SiteSimon, a product that aimed to turn your local browser into an intelligent assistant. Machine learning to mobile maids doesn’t seem like a natural progression, so we asked Gutentag why they opted to shutter SiteSimon and start fresh. Like transportation before Uber, Lyft, SideCar and other ridesharing and carpooling startups started making waves, they learned that the maid industry is severely fragmented, offline and that the top 50 companies control 30 percent of the market. The largest companies were founded in the 1990s and are predominantly focused on scaling, on opening more franchises — how they make money. Most of them don’t list their prices online, and there’s little transparency or accountability. These services often require users to call up to get quotes, have websites that look like this, require customers to have their own supplies and pay in cash. 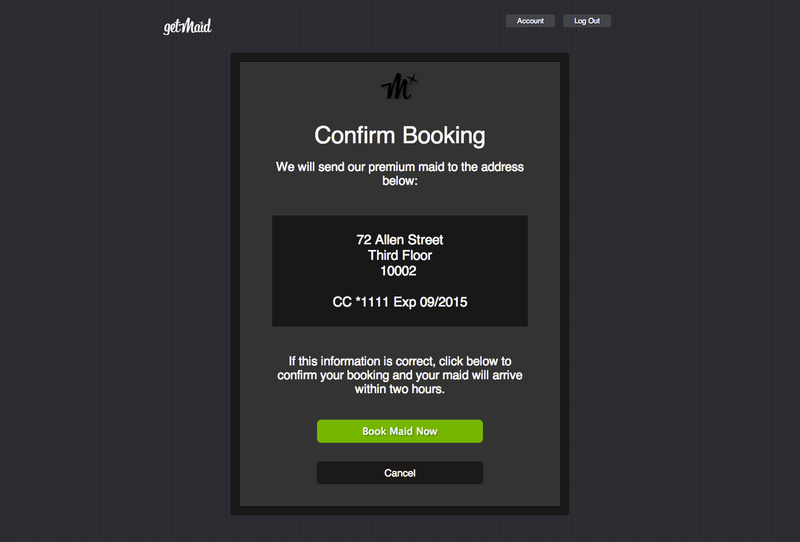 The founders saw a market that was sorely in need of disruption, so they began testing Get Maid earlier this year, focusing on a user experience that demands as little of the customer as possible, while maintaining consistency and quality. So, today, Get Maid provides each of its employees with a location-enabled smartphone, and guarantees that they will arrive within two hours. The service sends a text message to customers shortly after booking to give them a more precise ETA besides “within two hours,” i.e. 1 hour, 15 mins. Because of its internal GPS and real-time tracking ability, the service is able to offer fairly accurate estimates, Gutentag says. Soon, Get Maid will look to bring the same real-time tracker view to customers, so they can see where their Get Maid is and when they’re about to arrive. Maids sync up with customers on sight to give customers an estimate of how long they think the requested job will take, and if the owner isn’t there, Get Maid relays estimates to the customer and notifies them when the job is completed. Like Uber, the startup is trying to work with existing maid services so that they can source veteran employees, removing some of the leg-work of having to maintain their own huge fleet, insurance and so on. And, similar to Postmates, there’s a focus on efficiency, as Get Maid wants to be an additional source of revenue for its maids — and a significant one at that — so it encourages maids to clean quickly and efficiently and move onto the next job. Maids are also rated by customers after they finish and to incentivize them beyond stars (and more bookings thanks to high ratings), Get Maid plans to offer rewards, say, at the end of each month to those that rate the highest. Of course, behind all this, there’s an important issue at stake: Security. If maids are going to be left alone at your apartment while you’re at work, trust and reliability are crucial. While the collaborative consumption movement continues to grow in popularity, collectively this is really its chief downside. Airbnb has changed the way people rent apartments, but its entire model (and those like it) rests on that leap of faith, i.e. trust. One bad experience can threaten the foundation of the service, so collaborative consumption and P2P services have to take safety seriously if they expect to live long. Airbnb learned the hard way, which is why it now covers up to $1 million in apartment damages. Get Maid is taking the issue of security seriously, too, as co-founder Steven Gutentag tells us that each of its maids have been extensively vetted for quality, background-checked, trained, bonded and insured. The founder tells us that the key, as with any business, is in maintaining quality and consistency — which helps build trust. During its beta test run, the startup sorted through hundreds of applications, reaching out only to those who have been highly recommended and are experienced. The team then interviews the candidates, talks to them about their understanding of the business, how it works, and looks into their experience and references. Those who make the cut are then paid to make an observed “test clean,” in which the founders look for how the candidates interact with the customer, how/if they ask for instructions, along with the quality of their work. If they like what they see, they hire the candidates and get them bonded and insured. It may seem like overkill — or that this model could be unsustainable at scale — but Gutentag says that he thinks it’s critical to have this element of oversight in the early going. It’s this for this reason that the startup’s investors decided to stick with the founders in spite of the fact that Get Maid is a serious deviation from SiteSimon — the idea they initially invested in. The startup raised $500K last year from Ken Cron (the former CEO of Vivendi Games), John Ason (an early investor in Diapers.com and Hotlist) and Zeel co-founder Samer Hamadeh. Hamadeh, who recently joined the board, tells us that, even though it’s different, all of the original investors are still on board and are excited about the vision. While Get Maid may seem like fluff to some, I can say from my own personal experience that I understand the use case well. After moving into a new apartment recently, I wanted to get it cleaned. Admittedly (and for the sake of full disclosure), I’m a TaskRabbit user, believe in the service’s mission and have had good experiences, generally speaking. However, when it came to cleaning, it wasn’t that my TaskRabbit did a terrible job or stole something. But it still wasn’t great, not the fault of the service so much as that the person wasn’t a professional cleaner, they use TaskRabbit to make a few extra bucks on the side to pay for college, or whatever the case may be. So, providing those people who don’t want to call 20 different services to get quotes, spam their friends on Facebook for recommendations and want a service that specializes in cleaning, Get Maid seems like a good fit. Maybe that’s a small or very specific use case, but my hunch is that it isn’t. The startup wants to add the ability for users to book particular maids if they have a good experience, along with some other features that aim to personalize the user experience and add depth. 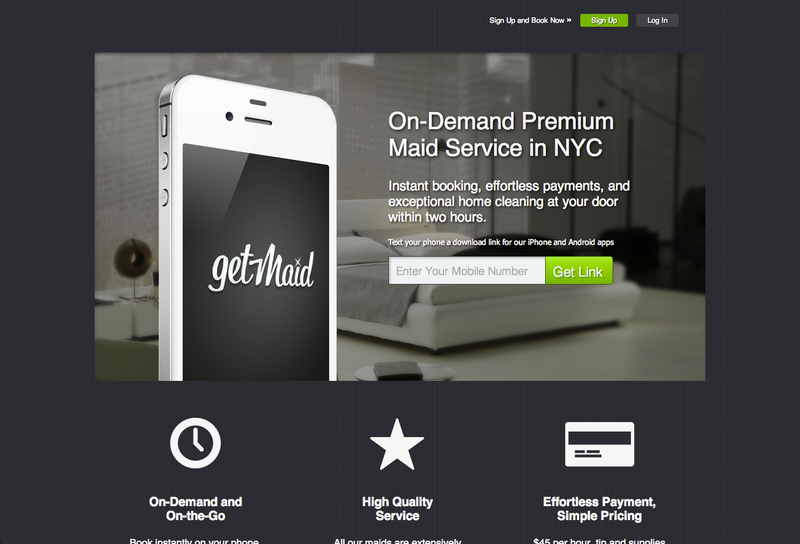 Unfortunately for those living outside of New York, Get Maid is only available in NYC, but the co-founders hope to begin rolling out into more cities next year. For those in San Francisco, there’s always the Y Combinator-backed HomeJoy. For more, find the service at home here.